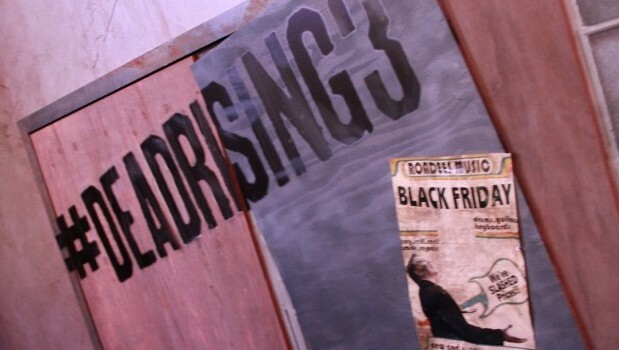 We have a first look at the upcoming Xbox One exclusive, Dead Rising 3 from our time at E3. Along with the impressions we also have a newly released developer video after the break. So grab a shotgun, a shark outfit and a sledgehammer-chainsaw blueprint and join us after the break! The graphics I saw in the initial Dead Rising 3 screenshots did not impress me. In all honesty, I was thinking of probably passing on it. I happened to pop by the Capcom booth, and when they handed me a ticket for the short line for the DR3 live demo I allowed myself to be ushered into the theater. After a brief introduction to the game developers the demo got underway. [singlepic id=14534 w=320 h=240 float=left]Enter Nick, a mechanic who works at Wrench-o-rama. Being handy helps him out in combining parts to build weapons that are far more effective than the standard guns you’ll find in the zombie-infested city. It’s not all bad – there are safe-houses dotted throughout, and survivors who have marked them for you to find. There are weapon lockers inside that let you recall any weapons, found or built. Not all of these sanctuaries are intact – during the demonstration we visited one that was infested with the undead. The zombies themselves, as the presenter explained, operate on a horde mentality – without distraction, they simply mill about. Sound, light and movement attract them and often you’ll use this to get around them. One of the neat things is that the zombies don’t generally catch up when you run – so it’s not impossible to move around the city. You do face overwhelming odds though, and Blue Castle Games have added a new zombie types. Individuals will remember a particular function of their previous life, so you can expect an undead fireman to be able to swing his axe, or an ex-cop to fire his gun. This makes some zombies far more dangerous. Thankfully our hero isn’t saddled with running back to administer medication, so it’s a much bigger world where we can roam and chase down missions or weapon parts on a whim, either solo or cooperatively. There are many missions to be had, some in the form of saving people, others in hunting down resources for your latest blueprint. It’s also nice to know that you can still dress up in goofy outfits, find items to boost your skills, and picking up common items to turn into deadly weapons. [singlepic id=14535 w=320 h=240 float=right]Dead Rising 3 impressed me with its scale and the lack of loading screens. At one point our mechanic pops out onto the balcony to see literally hundreds of zombies milling around aimlessly on the road. Of course he launches homemade grenades from his newly created grenade launcher into the crowd, killing dozens with each one. Before seeing it in action, I was ready to pass on Dead Rising 3. Zombie hordes and over-the-top weapons are all too commonplace in today’s gaming. After seeing the smooth movement, the sheer number of monsters and the new twists involved? I don’t know about my brainssss, but I’ve certainly had a change of heart.